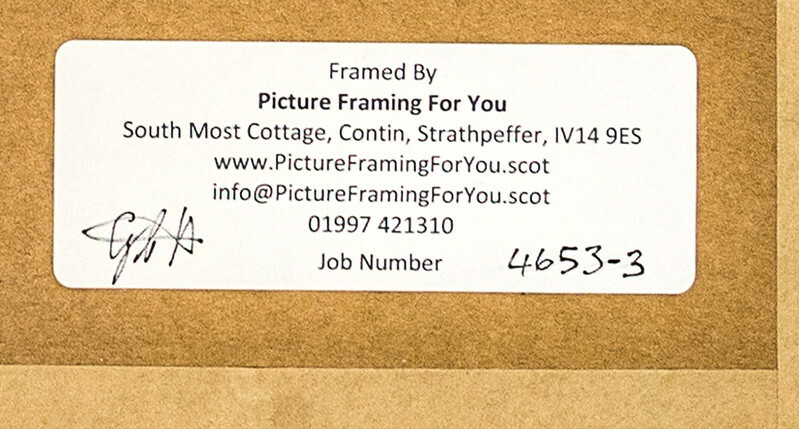 A finished picture frame back showing the label applied by Picture Framing for You (PFFY). This label identifies PFFY as the frame maker, the initials of the person who made the frame and an identifying job number. We hold records for all our jobs going back years which detail the materials used to make the frame. If one of our customers want another artwork framed in the same way as a previous one they only need to quote the job number. Note however that a moulding used to make a frame may no longer be available because the moulding manufacturer may have ceased to make it. In that case the nearest equivalent moulding currently available would need to be chosen. In most cases it should be possible to use the same mountboard.